I’ve always been a fan of the Mac Mini, a powerful machine in truly tiny form factor. Here’s a particularly awesome Mac Mini setup, with dual displays being powered using both the Mini-DVI to DVI adapter and a Mini DisplayPort to DVI Adapter ports. I didn’t know you could drive dual monitors on a Mac Mini using that method, but here’s proof that you can! 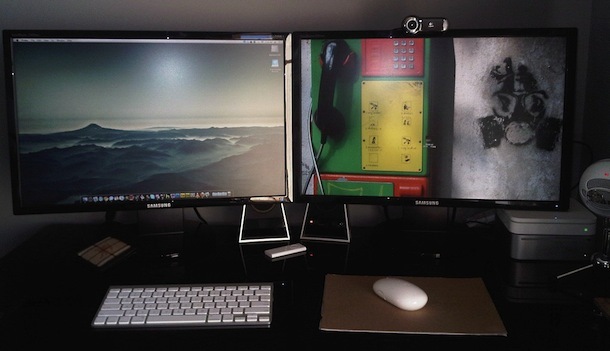 I run dual Viewsonic HD 22″ displays on my March 2009 Mac Mini, 1920×1080 on both displays. So beautiful, but they’re never as beautiful as the built-in display on the brand new 13″ MBP I picked up last month. Link for the right desktop wallpaper in the picture? Looks sick. What’s the model of the Samsung monitors?